Due to the current presence of NATO vessels in the Black Sea, especially those from the American navy, Turkey’s role as the controller of straits is becoming increasingly more important because both the Bosphorus and the Dardanelles may play a central role if tensions escalate in this region as they are the only points of entry into the Black Sea. The Montreux Convention of 1936 which regulates the transit of all warships through the Bosphorus and the Dardanelles dictates that Turkey is the only nation able to regulate transit from the Black Sea to the Mediterranean. A number of convention provisions allow Turkey far-reaching powers in terms of permitting vessels through the straits, and, therefore, the naval transit of any country is directly proportional to its relations with Ankara. Nevertheless, Turkey should not necessarily be considered the unspoken ruler of straits as even the convention itself allows for serious pressure to be exerted on Turkey with respect to the straits. This circumstance has already caused numerous clashes between Moscow and Ankara because, as many analysts believe, the “nightmare” of NATO’s rotational force on the Black Sea is presently becoming increasingly more realistic even though it was only hypothetical during the 2008 crisis. Between February 5 and May 12, 2014, 6 vessels from non-Black Sea nations have entered the Black Sea: 4 of them were American naval ships (the ill-fated American USS Taylor entered the Black Sea twice). Incidentally, the American USS Vella Gulf cruiser is scheduled to enter the Black Sea sometime around May 25, 2014 (Presidential elections in Ukraine). The Americans themselves do not hide the fact that the passage of their ships in the Black Sea carries a rotational character. NATO’s Supreme Allied Commander for Europe and United Air Force General Philip Breedlove stated that he “has been tasked with setting up ‘reassurance measures’ for their eastern allies”. Breedlove has said that since February of 2014, American vessels have been in the Black Sea “periodically, on a regular basis” and each American vessel leaving the Black Sea is immediately replaced by another or several. Russian experts claim that apart from exerting political pressure, the latter measures are also linked with American efforts to bring the naval component of their Missile Defence System as close to Russia as possible. Tensions in the Black Sea are also further strained due to the recently launched training exercises conducted by American and other NATO forces in the Eastern Mediterranean as part of Operation Active Endeavour. France has ordered two of its vessels to head to the Black Sea for these drills (Alizé and Dupuy de Lôme). Turkey is also conducting its own naval drills for seven frigates, one corvette, two submarines and several other vessels, which, admittedly, were planned in advance. In addition to this, there has been a wave of rumours published in various media recently that Turkey plans to close the straits to the so-called “Syrian express”, the technical and humanitarian aid being sent to the Assad government by Russia through the Bosphorus and the Dardanelles. This information is especially noteworthy during a time when several Turkish media sources believe that the Turkish government intends to depart from its previous orientation towards partnering with Black Sea nations to provide for the security of the sea region and instead turn towards more extensive cooperation with NATO. Let us closely consider NATO’s rotational policy in the Black Sea. Can the lack of a “Turkish filter” in terms of allowing the passage of NATO vessels be considered a change in Turkish policy in the Black Sea region, or, at the very least, can it be said that Ankara has started to cave to Washingtonian pressure as compared with its strait policy of 2008? Ankara’s actions on the matter already caused a diplomatic argument between the foreign ministries of two countries in April of this year, which has once again demonstrated that there is a serious gap between how Moscow and Ankara interpret Turkey’s controlling function over the straits. However, how problematic is the situation in reality? The main cause of concern is the ease with which NATO vessels are passing through the straits, but it is unlikely that this can be blamed on Turkey as all vessels belonging to non-Black Sea nations scrupulously observe their allowable deadlines for being in the Black Sea. The only exception here is the American frigate USS Taylor, which exceeded its permitted time in the sea by 12 days due to broken propellers. The Russian side was also irritated by the long-term presence of the American USS Donald Cook guided missile destroyer, which led the Russian Foreign Ministry to doubt that Turkey is duly monitoring compliance with the Montreux Convention. Despite the fact that the Russian ministry’s statement “surprised” the Turkish side (according to official information from Turkey, USS Donald Cook did not exceed its allowable time of 21 days at sea), this kind of routine clash can hardly be called deteriorating relations between Russia and Turkey, as these complaints were well-founded during the conflict between Georgia and Southern Ossetia as well and did not lead to any significant repercussions. Furthermore, Russian diplomats also periodically and frequently remind Turkey that she is not the sole sovereign of the straits. Russian military specialists also believe that American naval vessels that have appeared in the Black Sea do not pose any serious threat to Russia’s Black Sea coast. The “Syrian express” which is shipping military technical goods aboard the Russian navy’s large landing craft is also continuing its operations. On April 29, the large landing crafts Georgy Pobedonosets and Novocherkassk left Syria and passed through the Bosphorus strait en route to the Black Sea. On April 30, the vessels Yamal and Saratov returned to Syria from Novorossiysk through the Bosphorus. As for those Turkish analysts connecting the potentially greater NATO presence in the Black Sea with closer ties between Turkey and the U.S. to jointly secure the Black sea region, a significant portion of the Turkish political science community does not agree with this opinion. For example, the influential Turkish magazine C 4 Defence writes on the necessity of the Montreux Convention to toughen transit regulations for non-Black Sea nation warships, while the Yeni Safak (New Dawn) newspaper that is close to the Turkish authorities advocates for limiting access to the sea for non-Black Sea nations. 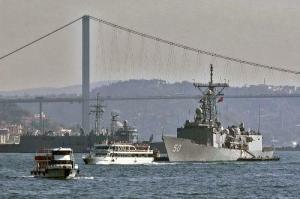 NATO’s increased presence in the Black Sea is unfavourable for Turkey due to other reasons as well. The Istanbul Channel is scheduled to be completed in 2023, which should diversify the possible exit points out of the Black Sea. In the event that the project is fully implemented, it may cause a new question to arise about regulations on entering the Black Sea. In this case, the increased presence of non-Black Sea nations in the sea is completely disadvantageous for Turkey. Turkey’s actions in the Black Sea have not changed significantly in light of the western rotational policy as compared with prior periods. Turkey is not obstructing NATO ships from entering the Black Sea mostly because Alliance members are not formally violating existing strait regulations and are not posing a real threat to Russia. Despite any attention-grabbing announcements, NATO itself is not hurrying to forcibly increase its presence on the Black Sea. There are presently no NATO vessels in the Black Sea that belong to non-Black Sea nations, while the much-touted arrival of France’s Dupleix anti-submarine vessel did not take place. In the present environment, Turkey’s disinterest in the events on the Black Sea is Ankara’s real policy in the region, which allows it to preserve its loyal relations with Russia while exerting minimal pressure on NATO through its allies. How long will this last? Seemingly until Turkey’s interests force it to clearly define its policies. Andrei Boldyrev, Ph.D. in History, research fellow at the Turkish Department in the Eastern Studies Institute of the Russian Academy of Sciences, exclusively for the online magazine “New Eastern Outlook”.